This thread here is for you guys to post what you want the game to be like. My hopes for the game are that we could develop a few different rulesets. One for skirmish, one for full sized battles, and one for boat battles. Now, I ask you. What do you think this game should be like? For ex., give ideas on what the world it takes place on would be like, what types of games we should make it into, what kinds of armies there should be (Humans, robots, mutants, etc. ), and what models we could use. I think a small skirmish Warmachine esque game would be cool. You could even have primitave planes in it. 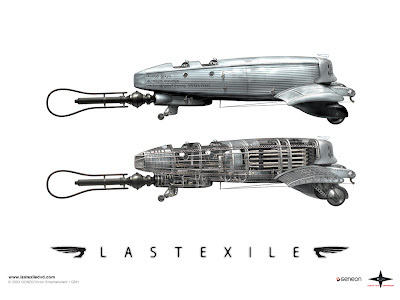 I'm not sure if anyone as watched the anime Last Exile but here is what I'm talking about. Something along the lines of that. A steampunk/cel-shaded type art style could be a way to go as well. Something that is a big happy. And the matches could be almost like gladiator put on between 2 people who summon things or leads some slaves into battle, with people "watching"
Anyway just a few ideas I'd be interested in. Do we have a time period for this yet? I think we should base it around the time of the exsaption of the Western World, the time of pirates and stuff. It would make more sense for them to be using boats instead of planes. We could make it some alternate world with magic and demons and the like. What's a tabletop game with out magic demons and the like? Okay, so it seems we have a time period. Should we have a set location? Or should it take place all around the world? A ship that only carries the leaders or valuable items. I think they are good ideas, should we expand on them? OK, so the world is divided several different alliances... NOTE: many nations are fictional. They were a bunch of little countries, and then banded together, only to become one in the end. This makes it a little easier than stating the names of twenty nations per alliance. Also, already existing nations are also probably larger. Example: Iran is actually almost the whole Middle East, except for Israel, Turkey (which also controls Greece, Bulgaria, and Romania,) and Saudi Arabia (which in turn controls Yemen and Oman.) I plan on making a map, but in the mean time, just remember that most nations are quite large. This game is basically alternative historyish; I'm not sure yet when it became different, but it is now around 1953, with roughly the same technology (you said you were going for WWII, so I tried to stay conform.) You have full permission to toy with this in whatever way you want; I'm just killing time. Here are the first two; after this I'll run it on with the Eastern European Circle, the Western European Alliance, the United Nations, (not like our U.N.,) the Latin Collective, the North African Strip, and the freedom fighters, which are many different factions under the same basic name. The Siberian Republic, Iran, The People's Republic of China, and the Seoul Conclave are the East Asian Coalition. While The PR is no longer fully Communist, it's still sort of obsessed. The living conditions are horrible, as most people work 12 hour farming shifts (back breaking work which can only be sustained through stamina pills,) or toil for ages in factories, coughing their lives away. Regardless, once you blot that little bit out, the EAC is a well oiled machine which acts quickly and decisively. It's average soldier carries a rifle (WWI stylish, because they are easy to make, although massively outdated,) and each squad has an officer and a heavy weapon. This broad definition makes it easy to specialize squads; a bazooka and a machine gun are both heavy weapons. Consequently, a bazooka squad might pick up some land mines and become a fairly proficient anti-tank squad. In the same way a machine gun squad could pick up a few SMGs and be a devastating anti-infantry unit. And there are many other heavy weapons. However, these are costly upgrades, and a unit that powerful is quite rare. Also in the EAC military is the Mahl-Zeit. This was originally the Siberian Republic's elite military police force, which sometimes also served at the front. Many are veterans from the Ukrainian Conflict (I'll have a concise history soon,) and makes them a good sight better than the poorly equipped conscripts the EAC tends to use. To reflect their veteranship, they have been given stronger weapons, and come in incredibly adaptable teams. These teams consist of a commander, a scout (which works well as a sniper,) a heavy weapons man (again, a very broad definition which can make the squad superb specialists,) one normal fighter, and a medic. They also have excellent camouflage and helmets with mesh which stop shrapnel, swords, and pretty much anything except a straight out shot to the face, and sometimes even that doesn't work. Vehicles are sometimes few and far between, and sometimes in such great numbers that they fall apart because there isn't enough fuel or food to sustain convoys. And while many are still left over from the '20s and '30s, a few are incredibly modern. The ZIK/32 is a tank which illustrates the usefulness of alliances. The Seoul Conclave, while small, is a leader in science. It made the 32, but couldn't produce it in great numbers, as Korea lacks proper military funding and resources. But when they joined the EAC a few years later, the tank plans were recovered. The tank had been so incredible that even now it was still 100% modern, and the massive resources of the PR of China and the Siberian Republic soon mass produced it in incredible numbers. With its 93 mm cannon and two 23 mm machine guns, not to mention incredibly fast motors and a flame resistant gasoline tank, it is a devastating weapon. In addition to the long line of ZIK models, many other tanks exist, although like other aspects of the EAC, figuring out what is what and where can make it difficult to ever account for most of them. The navy of the EAC is probably its weakest point. On land, they have good artillery and some good tanks, the Mahl-Zeit, and sheer numbers. But at sea, their navy is little more than a pile of rusting ironclads. They even have a few wooden ships, although these are rotted straight through. And while on paper their navy consists of several battle fleets, each around 50 ships, more than 50% of these are not seaworthy and many more are unreliable. The only thing that makes them able to compete at all: their air force. Carriers are their only hope at sea; to destroy all the enemies before they can really engage. Sometimes it works, sometimes it doesn't... naval warfare is little more than a game of luck for the EAC. The EAC's greatest competitor is Japan. Japan controls almost every island east of the Asian mainland, from ones only a few miles off China all the way to Hawaii. They have also inducted almost all of Siam, (Vietnam, Laos, Cambodia, etc.) and more than half of Australia. These countries united under Japan's banner so that they might challenge the incredible might of EAC. And it seems to be working. Almost every war between the two Asian 'camps' starts with a war of attrition in the jungles of Siam, which is eventually won by the EAC. Then, several naval battles take place, which force the obliterated EAC navy into its ports, and finally, the elite Australo-Japanese commandos come in, devastating Korea and China. Yet these wars so utterly obliterate Siam that they tend to be more stalemate than victory for the Japanese. The Japanese rarely function in great numbers; much more often they take a force of incredibly elite commandos onto the mainland. The only tank they use is the Ho Mi Type 2, an amphibious tank and troop carrier. The commandos come in groups of seven, and can be bonded into teams of fourteen or twenty-one, asthe occasion requires. They have the latest in armor, and their sniper rifles are laser guided (I know they didn't have that in 1950; I wanted to spice it up, so I tweaked a few things, but like I said, it's mostly WWII) as well as so fast that you don't even hear the shot before it hits (that is true to the time.) These can kill dozens of EAC soldiers, but are often finally flushed out by Mahl-Zeit if they remain to active. Thus, a team must be able to hit the bar between noticable and ineffective. This means that they have to work well together, which engenders incredible mutual understanding. A retired commando may return to his family, only to find that even they are stranger to him than his team. The planes of the Japanese airforce are not particularly effective. While not weak, they are short-ranged, and often unable to airstrike unless they are right next to the combat zone. Most are propeller planes, and the Japanese have no helicopters at all. Their navy is very good, however, and has many Type 15 Cruisers, so fast they can often be harrying the Chinese fleet before it has fully left port. The 15's are also very capable when it comes to submarine warfare and warding off aircraft with a targeting system similar to that of the commandos. Speaking of submarines, here the Japanese are also superb. They have a massive fleet, which often wittles down the enemy before it even engages. To the U.N., this was an incredible handicap which lost them the war in 1938. How's that? I have more detail, but didn't want to go encyclopedia. Also, I can answer specific questions that you might have. Cool, I'll work on some more guys. The North African Strip is now the North African League. When the EAC decided to attack Vietnam in 1943, it envisioned a long war through the jungles, inevitably resulting in an eventual victory. The navy would have been an issue, as usual, but they also had a new ship, the Kari-Kami, a devastating destroyer with anti-sub and anti-air capabilities. When the war began, the EAC admiral, Admiral Hong Wu, instantly deployed these along key points near Japanese airbases and harbors. They harried the fleet and crippled it so utterly that it couldn't leave for several months. The air force attempted to destroy them, and while they got a few, it was very much a Pyrrhic victory, and what little remained to bomb China was soon destroyed. With the issue of the navy resolved, the massive armored divisions of the EAC moved in. Shortly thereafter, Iran agreed to send some divisions for a small sum as well. Being veterans of desert fighting and more, these only added to the momentum the EAC was fast achieving. But the British controlled India, and they were unfriendly with the EAC. Soon, they were leasing Egyptian and Indian weapons and mercenaries to the Japanese for very affordable prices. This helped the Japanese, who valued the Stens and veterans the received very much. Finally, they fell back to Dienbienphu, [the valley from the Vietnam War] where they laid a trap for the advancing enemy armor. They built a mock base in the middle of the valley, and concealed themselves in the mountains around it. Soon, the massive armored units poured in, shelled the base, and were about to move on when all hell broke lose. Anti armor weapons, cannon, Japanese tanks, and waves of infantry swept down onto the unsuspecting Chinese as they examined the base. Within a few hours, only the rearguard was left, retreating up the mountainous roads. Yet at the same time, a Kari-Kami was captured. Within a few weeks, the Japanese had improved it and built the Type 15, the definitive destroyer of the era. The 15s soon neutralized the Kari-Kamis, and the fleet, now repaired, poured out. Yet the Chinese had a final trick up their sleeve. As the navy moved out, every plane in China descended on it. This may seem perfectly ordinary, but this was at precisely the time a drill was expected. A Siberian spy had informed them, and now the Japanese, completely unsuspecting, were stunned to find real bombs falling. They opened fire, but it was too late. Once again, the navy was forced to return. Yet an even more stunning thing occurred at the same time: the Siberian Republic ordered in its soldiers. They landed on the northern isles of Japan, conquered them, consolidated, and finally moved on towards the mainland. Japan instantly threw up massive defenses along side its already formidable fortifications, but they were shattered in a 48 hour barrage from the battleships of the Russian navy. Finally, over 60,000 Siberians stormed onto the shores of Japan. Only 5,000 reached Tokyo, and thousands of reinforcements died as well, but the war ended there. The Chinese annexed parts of North Vietnam, Burma, and a small port in Thailand. The Russians received the Kuriles, and the Seoul Conclave, who had really done nothing, (but had still declared war because its allies had done so,) received several small port cities in Japan. While Japan won much of this back in the 2nd Vietnamese conflict, it learned many valuable lessons, both in spying and naval combat. However, although this was a loss for the Japanese, many say it was responsible for the massive overhaul of the Japanese navy which has made it as strong as it is today. In the year 2078, the Earth's water supply had been reduced to a tiny fraction of what it once was, causing unimaginable chaos. The free society's of North America and Europe banded together to find a solution to the problem. They concluded that they had to find a way to create more water for the Earth. In 2090, they finally found a solution. Gerber Hall, a European scientist, had been working with a research team in Greenland, who had been drilling into the earth to research the various underground creatures, and how they survived without water. The answer was unbelievable. Deep underground, they found a massive body of water, two times the size of North America. Gerber and his team presented the findings to The European and North American councils, who eagerly took the information in. But humans are a greedy race. The NAEU (North American and European Union), decided to hide the information from the rest of the world, and keep the water for their people. When news of this atrocity reached the other countries of Earth, they were outraged. Africa and most of the Arab countries declared war on the NAEU. Asia joined with them, while South America and Australia stayed with the NAEU. World War 3 had been set into motion. 2110: After twenty years of constant warfare, events would suddenly change for the worst, and Earth would become hell. NAEU began to overpower and conquer the URF (United Revolutionary Front), and it seemed the war would soon be over. But the URF would not be silenced so easily. In one last act of defiance, the URF let loose all of it's Nuclear Weapons and other WMDs. These weapons were fired at random targets, to cause as much chaos as possible. With 400 WMDs fired, the world was thrown into an Apocalypse. The human population of Earth was depleted to but a quarter of it's original amount. Cities were destroyed and countries ravaged. The underground body of water was then dispersed over the entire planet, only to be polluted by the radiation. Earth became almost completely inhospitable to life. Present Day: Now the human race has been scattered into roving bands of lunatics who fight amongst themselves and against the other warbands. Mutants and crazed monsters wander in the wasteland that is Earth, and kill anything they can find. Some humans have stayed together, forming makeshift cities and towns, where they can be somewhat more safe than on the outside. This is the premise of the game. It would be a skirmish game with each player controlling a small warband of individuals. What do you guys think? Last edited by SageMonkey on Thu Jul 30, 2009 1:49 pm, edited 1 time in total. i realy do liek it though i am not so sure about the mutants thing but hey we could make it work.